****Superior Hotel Matterhorn Focus welcomes you to a refined yet familiar atmosphere. 30 luxurious cozy rooms and suites, expressing a combination of old and new, invite you to enjoy tranquility and relaxation. This “Design and Lifestyle Hotel Garni” was created by Heinz Julen, world famous for his eye-catching creations is a work of art. The architectural style is elegant, without being obtrusive, blending perfectly into the mountain environment. 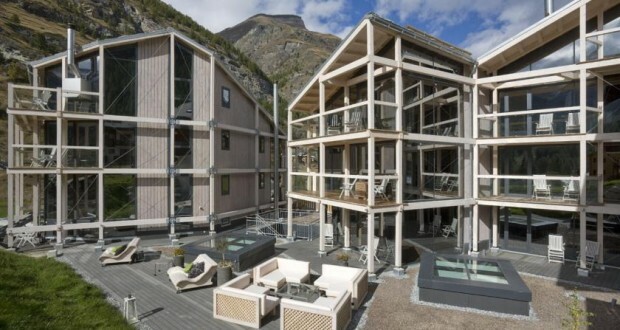 The furnishing in the rooms and suites have been designed by Heinz Julen too and constructed in his studio in Zermatt. His blend of material and style is unique and give the rooms an extra special flair. The Matterhorn Focus is situated in a quite location just next to the cable car station “Klein Matterhorn Paradise”. You can reach us easily via an underground passage. The village center can be reached on foot in less than 15 minutes. Start your day with a balanced breakfast. In the evening we invite you for an aperitif in our cozy lounge with fireplace. Upon request, we gladly reserve your dinner in one of Zermatt’s finest restaurants. We look forward to welcoming you at the FOCUS and wish you a very pleasant and unforgettable stay.